James S. Langer is Professor Emeritus of Physics at the University of California, Santa Barbara (1982-present). Other institutional affiliations include Carnegie Mellon University. His research interests include theories of nonequilibrium phenomena and pattern formation in fluid dynamics. September 21, 1934Birth, Pittsburgh (Pa.). 1955Obtained BS, Carnegie Institute of Technology (now Carnegie-Mellon University), Pittsburgh (Pa.). 1958Obtained PhD in Mathematical Physics, University of Birmingham, Birmingham (England). 1958 – 1982Instructor in Physics (1958-1964, when Carnegie Institute of Technology); Assistant Professor to Professor (1964-1982); and Associate Dean, Mellon Institute of Science (1971-1974), Carnegie Mellon University, Pittsburgh (Pa.). 1966 – 1967Visiting Associate Professor, Cornell University. 1982 – presentProfessor of Mathematics and Physics (1982-2007); Director, Institute for Theoretical Physics (1989-1995); and Professor Emeritus of Physics (2007-present), University of California, Santa Barbara, Santa Barbara (Calif.). 1985Member, National Academy of Sciences. 1997Awarded Oliver E. Buckley Condensed Matter Prize, American Physical Society. 2001 – 2005Vice President, National Academy of Sciences. Advised by Langer at University of California, Santa Barbara. Advised by Langer at University of California, Santa Barbara, "Shear localization in the shear-transformation-zone theory of plasticity in amorphous systems." 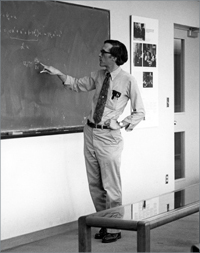 Advised by Langer at University of California, Santa Barbara, "Stability of domains in phase-separating binary fluids in shear flow." Advised by Langer at University of California, Santa Barbara, "Amorphous systems in athermal, quasistatic shear." PhD advisor at University of Birmingham. Both employed at Carnegie Institute of Technology and University of California, Santa Barbara. Obtained BS (1955). Instructor in Physics and Assistant Professor to Professor. Assistant Professor to Professor and Associate Dean, Mellon Institute of Science. Received 1997 Oliver E. Buckley Condensed Matter Prize and President. Obtained PhD in Mathematical Physics (1958).